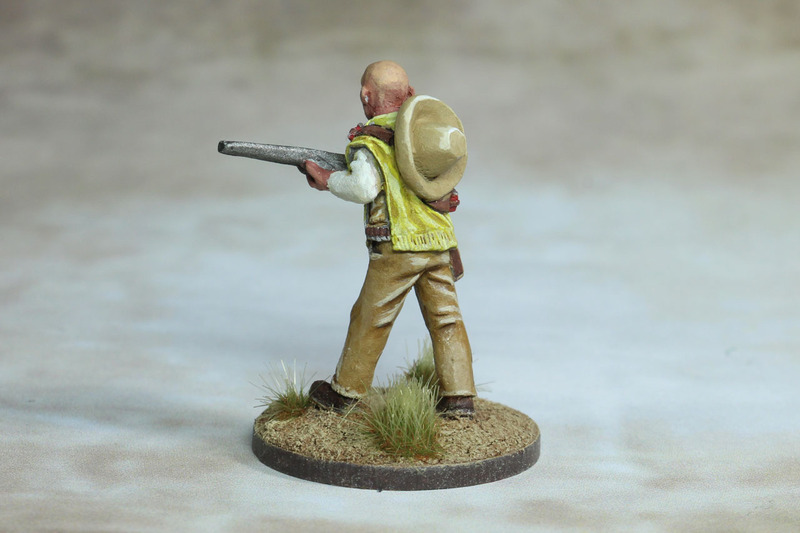 With Tuco I went back to the experience I gained with painting Hector’s jeans and painted the poncho in yellow. At first I wanted to apply a light base color layer and tone it down it with a wash, but by mixing in white, it looked nicely faded, so that I used a lighter one than the intended wash. Of course, the pants should look similar raggedy and so I decided to keep them beige. 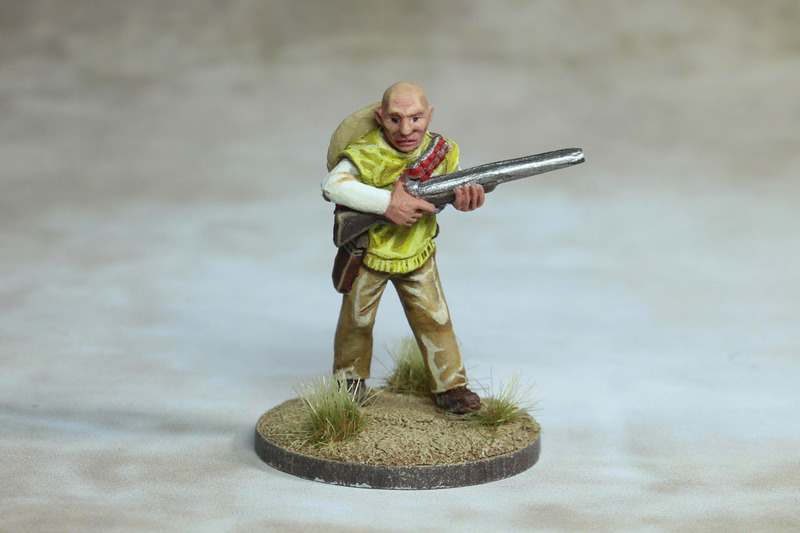 I wanted Tuco to give the impression of a poor helper. Again, I chose leather brown for the accessories and worked with a rather earthy toned wash over the reddish brown of the first layer of color. This way I wanted to create some irregularity to imply a worn look. The most difficult part was the head, since it was a distinctive part of the Mini, I had to do some corrections before I was satisfied. 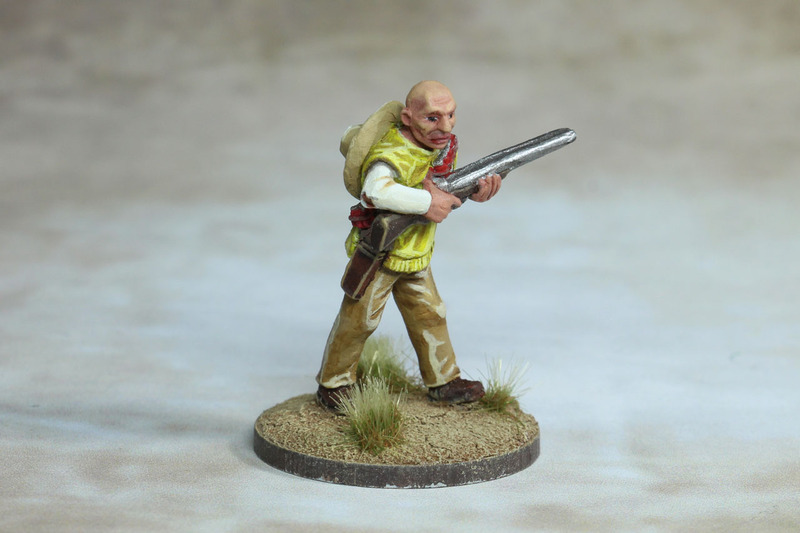 When I was almost finished, the miniature seemed to be a bit pale overall, so I decided to paint the shotgun cartridges in a bright red to create an optical anchor point. I also liked the idea of the red cartridges as they are known from various movies (possibly not quite historically accurate, but with high recognition value). Once again, he accompanied El Segundo to some business meeting. He didn't know much about business, but he was too proud to admit it. Tanner liked him, he was sure about that, and one day he might be able to take El Segundo's place and become a foreman himself. They met in the bar with "El Toro", McMiller's right hand man. He was supposed to bring some things for Tanner, but didn't have them with him and El Segundo was obviously very unsatisfied about that. "That's why I shall emphasize the message" should be the last thing "El Toro" snarled at them. He’d show that guy to talk to him like that! But "El Toro" beat him to it. His right hook caught him so surprisingly on the chin, that he stumbled and fell over his chair, out of the window. When he regained consciousness this Culero was already gone. That screamed for revenge. But he’d have to get the right gun for that first. A Revolver? No, they weren’t his thing. But there was always the old shotgun in Tanner's shed, which he had to hunt coyotes and mountain lions. That was just right. And ... who would ever miss with a shotgun?